Click "Create Template". In the "Choose Source" step, click "Start from an existing template". 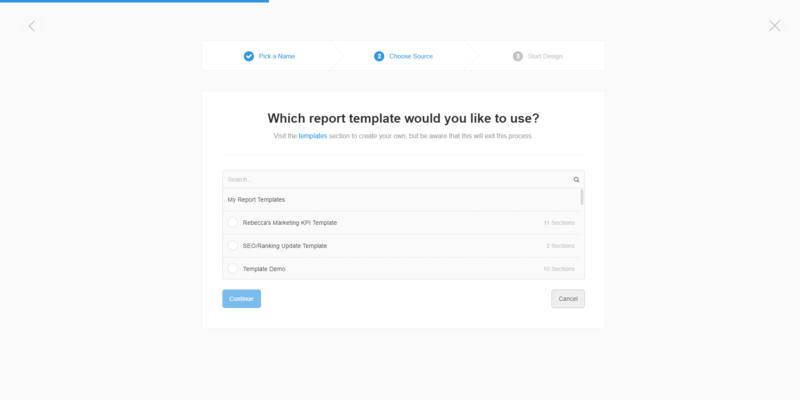 Start the report template creation process as normal by clicking "Create Template" from within the Templates tab of the main Report section. In step 2 of the "Create Template" wizard (Choose Source), select "Start from Another Template". Select the template that you'd like to clone, then click "Continue". The template design editor will then open, where you can make any additional changes or customize your new (cloned) template to meet your business needs.